Mostly because of the increased costs of trade services, wholesale inflation rose in March at the highest monthly pace since November. Including volatile prices for food, energy and trade services, the Producer Price Index rose 0.3% from February and 3% from March 2017, the Bureau of Labor Statistics reported. Excluding those prices, the core rate of wholesale inflation rose 0.4% for the third month in a row. Year-to-year, the core rate rose 2.9%, the highest since August 2014. The nation’s wholesalers continued to adjust supplies more closely to demand in February, as inventory levels rose 1%, matching a 1% increase in sales, according to the Commerce Department. The inventories-to-sales ratio, a gauge of how lean businesses are operating, didn’t change after months of inventories outpacing sales. Year-to-year, wholesale inventories were up 5.5% while sales had risen 6.8%. The broadest measure of inflation, the Consumer Price Index, declined 0.1% in March, led by a 4.9% drop in the price of gasoline. 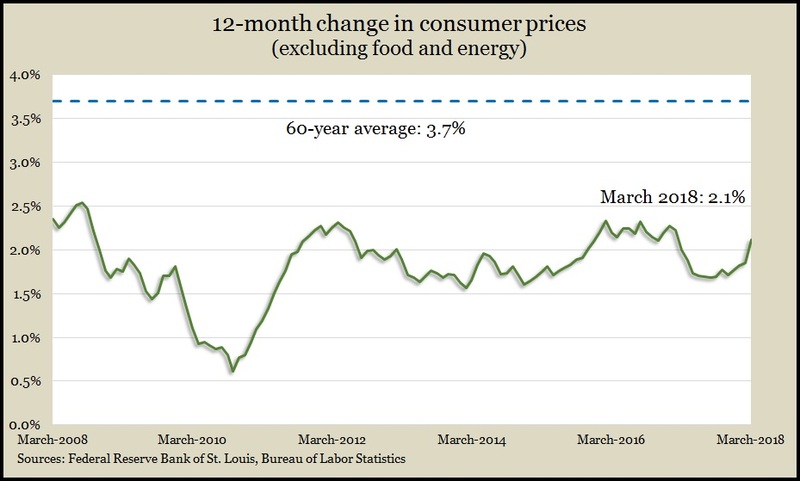 Excluding energy and food prices, the CPI grew 0.2%, the same as in February. Year-to-year, the core 2.1%, the biggest gain in 13 months, according to the Bureau of Labor Statistics. Higher airline fees, shelter costs and medical services contributed to the annual inflation. The moving four-week average for initial unemployment claims rose for the fourth week in a row and the fifth time in the six weeks since it hit the lowest level since 1969. Data from the Labor Department show new jobless applications are 35% below the 51-year average. Claims have been below average every week since the beginning of 2013, underscoring a tight labor market, which should empower consumers to spend more and should eventually prompt pay raises. U.S. employers reported 6.1 million job openings in February, down 2.8% from January, which was second highest only to September in 17 years of data. The Bureau of Labor Statistics also showed a 1.2% decline in the number of hires. Year-to-year, vacancies rose 7.7% while filled vacancies rose 4.6%. A widening gap between employer demand and the supply of suitable workers underscores the tightening labor, which should push up wages and fuel consumer spending. The University of Michigan said its preliminary consumer sentiment reading for April declined, especially in the expectations component, largely because of concerns about the domestic effects of changing trade policies. Attitudes toward current conditions also fell but remained relatively elevated compared to past years. An economist with the survey said consumer sentiment is consistent with a 2.7% annual growth in consumer spending.